Consider this your ultimate guide to finding the ideal wedding hairstyle for you — and pulling it off! 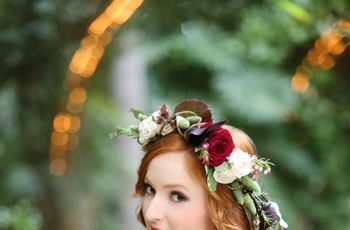 Whether you’ve had your wedding hairstyle picked out since you were little or are still trying to figure it out, there’s a lot that goes into planning a wedding ‘do. 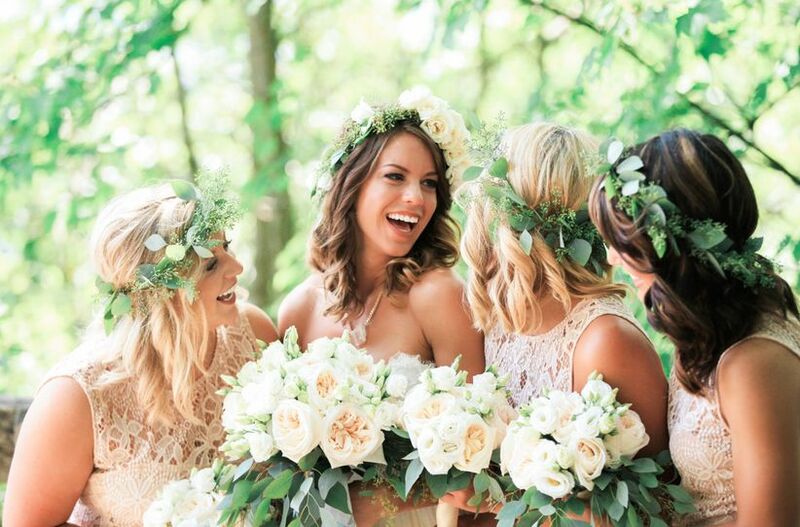 From finding the right hairstylist to prepping your hair before the big day and making your style last all day long, it can be tricky to crack the code on wedding hair 101. 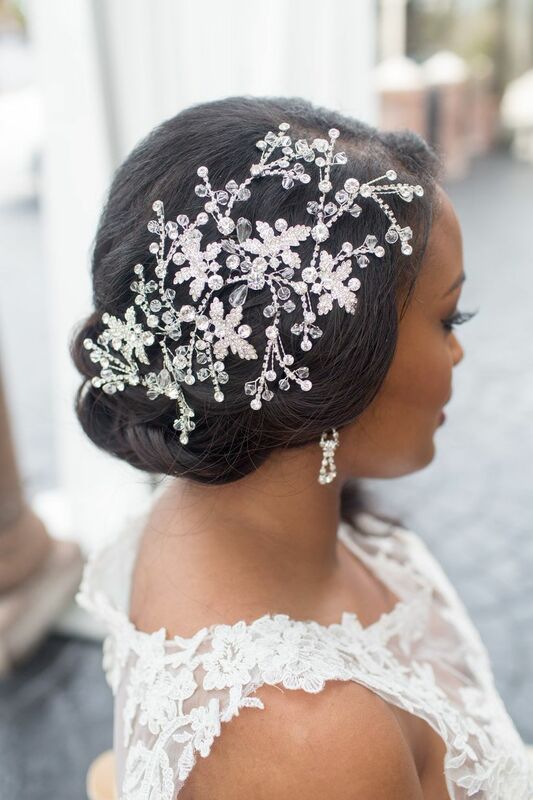 You’ve probably got a few other things on your mind right now, so we’ve taken care of all the details to make sure your hair looks simply incredible on your wedding day. Not sure where to start? Here's everything you need to know about finding that perfect wedding hairstyle. 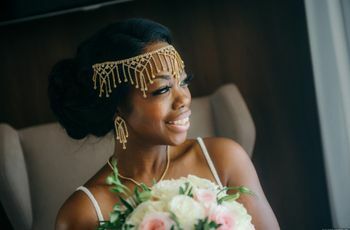 You can’t trust just anyone to make your hair look gorgeous on your wedding day, so finding the best wedding hairstylist is a process that requires patience. While you’re on the hunt, you definitely need to keep a few factors in mind! First off, don’t forget your budget. This will help you weed out stylists whose rates are simply too high for you. You should also keep a stylist’s communication method in the back of your head when making your decision. If they’re not asking what you want, and rush straight ahead to their own recommendations, they’re probably not the best fit for you. 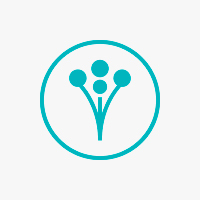 When it comes time to search, reading online vendor reviews for stylist recommendations can get you well on your way to finding someone awesome. And don’t forget to ask your own hairstylist! You trust them already, so why not give them a chance to style you on your special day? You may have dreamt about your wedding dress and hairstyle from childhood, but your vision is bound to change over time. So when you’re selecting your wedding hairstyle you should consider a few factors. First off, what’s your go-to hair look? If you’re a gal who hates having her hair constricted but are dreaming about a classic updo because you see how gorgeous they can be, you might want to reconsider your choice. You want to make sure your look fits your own style, after all! What about the location of your wedding? 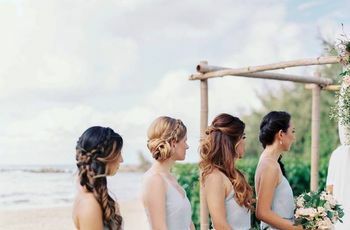 If you’re getting married outdoors, you should probably plan for potential weather issues, and opt for a hairstyle that can withstand what Mother Nature throws at it. When you’re at your trial, you should also take advantage of the time with your stylist to communicate about how much product you want him/her to use, and you should bring along a bridesmaid who will be brutally honest about how your potential style looks. If you still have no clue how you want to wear your hair, why not get inspired by some of the classic ‘dos that many brides wear for their big day? Klewitz says waves and a side chignon are always classic options. Your hairstylist can work wonders, but he/she can only do so much if you don’t take care of your hair leading up to your big day. That’s why you should start a dedicated hair care routine weeks (or months) in advance. That means stocking up on nourishing hair masks, like Kerastase’s Discipline Masque Curl Ideal so you can indulge in weekly to restore hair to its healthy state. Making conditioning a part of your routine every time you shower is also vital! Give hair the moisture it craves and the control you desire with a formula like Oribe’s Intense Conditioner for Moisture & Control. Treatment serums (we love Leonor Greyl’s Serum de Soie Sublimateur) should also be a part of your repertoire. 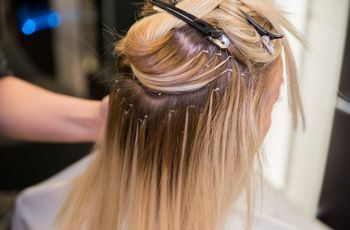 A lot of brides assume it’s best to schedule a pre-wedding cut/color right before the wedding, but that’s not necessarily the case. The style you decide on can often dictate whether you should get a cut right before your big day or not. “If you want an updo, usually having longer and more hair to work with is better. Too long can be cumbersome and weigh down some styles, especial down styles. Talk to your stylist to determine when cutting or a trim should happen,” Klewitz says. The same goes for color! You should always do a color trial run a few months ahead of time, or go to someone who knows your hair. You don’t want to take any risks before your wedding day! It’s your wedding day, and you have a million and one thoughts running through your head! Your hair shouldn’t be one of them, so we did the research and found out just how your hair should look when you show up so your hairstylist can get you ready in the most efficient way possible. Every stylist has their own personal preference, but the general rule of thumb is not to show up with wet hair if you’re getting any type of dry styling done! “It depends on the style, hair type, hair texture etc. But as a safe bet, I always prefer clean, dry [hair] preferably washed the night before. If you have very curly hair and you're going with your natural curl, wash the morning of and add your normal regimen of curl product. The stylist can usually work from there,” Klewitz recommends. If your locks can’t last through the ceremony, the reception, and the drive home, there’s a problem! Longevity is the name of the game when it comes to wedding hair, and your stylist should focus on making your strands go the distance. 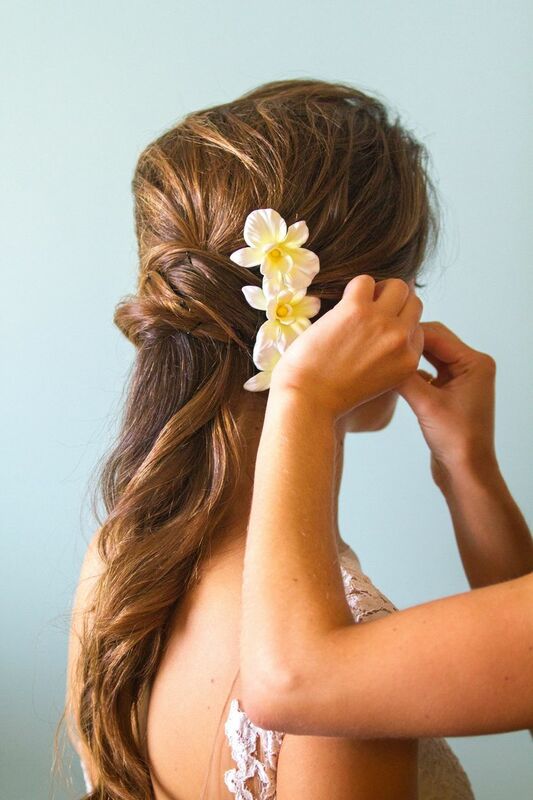 “It depends on the style but wedding hair is different in that the prep is usually set to hold a specific style. If you want an updo I'd set the hair in a certain direction to create the right volume and shape for the finished product,” Klewitz reveals. Top-notch products, accessories (seriously, bobby pins are a stylist’s best friend! ), and strategic styling make a world of difference when it comes to creating a lasting style that will endure through a night of celebrating and dancing. One of your top product must-haves to ensure a long-lasting style? A hairspray that keeps your style in place but doesn’t leave any residue behind, like R+Co GRID Structural Hold Setting Spray. Outdoor weddings are beautiful, but they also require a bit more planning than indoor ceremonies. Your hair, after all, is bound to come into contact with various potential elements like wind, rain, humidity etc., and your hairstyle needs to work around all of them. Make sure your ‘do goes the duration by planning ahead with your stylist for any potential weather woes. If you’ve got straight to wavy hair, make sure your stylist is packing a styling lotion in their tool kit and a root lifter to give your locks some enviable volume and shape, especially for updos. If you’ve got curly hair, make sure you fight frizz from the get-go with a strong shampoo and conditioner combo . For summer brides, Klewitz always keeps an anti-humidity and anti-frizz spray like Garnier Fructis Style Sleek & Shine Anti-Humidity Smoothing Milk on hand to fight back against frizz.